Profile Racing have released a new Liam Eltham signature colorway to keep their 50th anniversary party going strong! 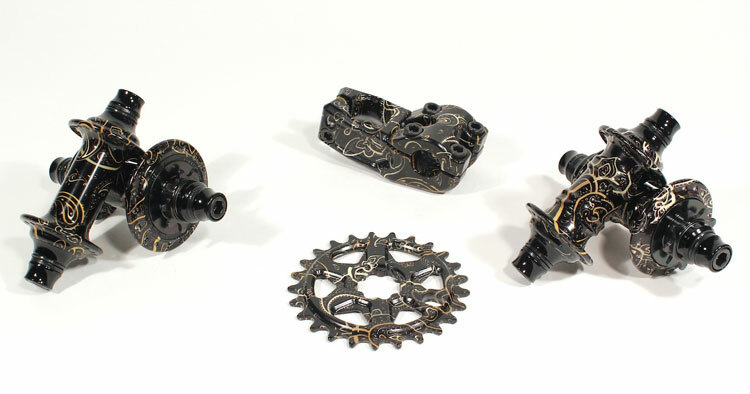 This time around Liam went with this rad Gold and Black Paisley color that you can find on Profile’s Elite hub sets, Mini hub sets, Push topload stem and Sabre sprocket. Each of these items are available through BMX shops and mail-orders that carry Profile Racing world wide now. They should be available in the Profile Racing webstore any time now as well. Get on it! We have a feeling these will go quick. Liam Eltham’s X Profile Racing 50th anniversary Gold and Black Paisley. Contact your local bike shop for availability. Some of the Profile Racing U.K squad made their way on out to Malaga, Spain to spend a few days out cruising the skateparks, street spots and more that the city has to offer! Needless to say, the crew ended up with a ton of great clips that you can check out in the BMX video above! “Profile UK riders Angus Gough, Lima Eltham, Cam Peake, and Jay Hobson travel to Malaga, Spain in search of good times and epic spots. Watch the adventure! Style on style on style in this new round of Calling the Shots with Lima Eltham! Hit that play button and see what Dean Cueson comes up with for tricks for him to do! Head over to the Relentless site to check out an interview that Matt Priest and Lima Eltham did with each other.